California assembly bill AB1014 has unanimously passed the Assembly Committee on Utilities and Commerce. The bill has had some significant changes in order to work with a new green power purchase program. "Off-site renewables arrangements allowing ratepayers to purchase shares in renewable facilities and receive generation credits on their utility bills can enable low-income Californians and those who don't own their roofs or who aren't oriented toward the sun to participate in the market for renewable energy." The 500-kilowatt Boulder Cowdery Meadows Solar Array officially opened Friday, becoming the first community solar garden to launch in Xcel Energy's Colorado service area since the passage of a law in 2010 permitting them. Power from the array is now available to participating commercial and residential county ratepayers. Colorado residents will now be able to enjoy even more clean energy coming out of their outlets, along with cleaner air and less carbon pollution. After nearly two days of strenuous debate, Colorado’s House of Representatives voted shortly before midnight Friday night to strengthen the state’s successful renewable energy standard (RES). The bill, which has alreadypassed the Senate and is supported by Governor Hickenlooper, will increase the clean energy standard to 25 percent for rural electric cooperatives by 2020 — a 15 percentage point jump from the current 10 percent. This would mean in seven years, rural areas of Colorado will benefit from one-quarter of their energy portfolio being derived from renewable sources. COLORADO SPRINGS, Colo.—Just weeks after the former Colorado Springs City Council voted to expand the Colorado Springs Community Solar Garden, the new council is set to reverse course. New council president Keith King said the backtracking will not scrap renewable energy programs. The council needs more information about other cost-efficient ways to structure the program, he said. The future is here -- it’s just unevenly distributed. This old quote found a new application at the Pathways to 100% Renewable Energy conference in San Francisco last week. An international crowd of energy experts, financiers, clean energy advocates, elected officials, government employees, academics, and more gathered there to discuss how to bring the renewable energy future to all. Even those in favor of renewable energy have been known to debate how much of our power it can provide. But at the conference, the question was not whether we can get to 100%. Instead, speakers asked, How do we get there? And how soon? Answers vary, and multiple approaches are needed -- many of which were shared at this event. Out of all the details and perspectives, a few themes came to the fore. I just got this letter from the team at SunShare in Colorado Springs, Colorado. 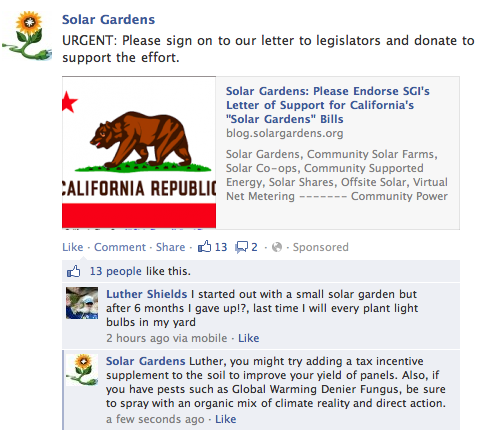 They need support, especially from those with successful solar gardens projects in their areas. Please read and take a moment to contact them. Community solar in Colorado Springs, CO needs YOUR HELP. After a successful 2-year pilot program, the new City Council has issued a resolution to kill community solar as their first agenda item, which they will vote on TOMORROW. This is extremely unfortunate, given that many of the 14 states with Solar Garden legislation have followed Colorado Springs’ lead with its first-in-the-nation 2011 2-MW Pilot Program. The new program would bring an additional 10 MW of clean energy to Colorado Springs by 2016--but if it is cut, it will reverse the positive momentum and leadership that Colorado Springs has built. If you are able to speak, please RSVP to Karen Gados at karen@mysunshare.com. Colorado Springs has already been a leader in community solar--it is not time to go backwards. The Solar Gardens Institute (SGI), a national community solar advocacy organization, strongly supports SB43 and AB1014 as part of an effort to make solar energy more equable and available to all. If passed, the legislation would allow financial participation in solar projects to those who have shaded or poorly oriented roofs, renters, and those who would otherwise not be able to afford solar energy. SGI supports good community solar policy everywhere. Our position on the bill is driven by our Mission Statement, Founding Principles, and Principles of Responsible Solar Development which can be viewed online at http://www.solargardens.org/about/. One important amendment included in the 2012 bill seems not to have made it into the 2013 version. This is a provision that would require 40% of participants' capacity to be within the same county as the community renewable facility. SGI's principles would encourage local participation - after all, these are called "community" projects. We therefore ask this provision be restored. SGI strongly encourages supporters of California's shared renewables bills SB43 and AB1014 to visit http://californiasharedrenewables.org/ for the latest information. The vision we are working towards at the Solar Gardens Institute in many ways is similar to that of Amory Lovins of the Rocky Mountain Institute: distributed renewables and storage, owned locally by those who use the power. http://www.rmi.org/keysolutionselectricity2 In the long run, each feeder line can become a microgrid, with the ability to island and be self-reliant during a failure of the larger grid or extreme weather http://blog.rmi.org/blog_2013_01_10_microgrids_providing_safe_harbor_in_a_storm . Each microgrid can have up to double the solar capacity it needs in order to export to areas experiencing cloudiness, while requiring little additional long distance transmission (thus a local ownership requirement of about 50%, rather than 100%). I can give you the small-town dweller's perspective on this. I live on a small island (Orcas, pop. 4000) off the coast of Washington State. Before that I lived in the San Luis Valley, with even smaller communities. I have also done presentations and worked projects in many other rural areas. There is a lot for a city person to learn when they move to these places, it takes at least a few years to “get it”. Of course in small towns it's hard to get agreement on anything. But what they do agree about is self-reliance. Everyone everywhere wants to produce and use power locally, from transition town advocates to the most rock-ribbed county commissioner. There is also a controversy around the scale of power export - projects where the power is going somewhere else are often opposed for environmental or aesthetic reasons. Every small town I've ever been involved with has had issues with money supply. Money tends to leave the area and not come back - especially for large recurring expenses like food and electrical power. "Buy local" and local currency campaigns are everywhere, seeking to leverage the multiplier effect when a dollar changes hands several times. While it does cost more per watt to build local power, rural areas have greater access to grants that can help level the playing field. Solar economies of scale are fairly small for systems larger than 10 kilowatts http://www.ilsr.org/distributed-small-scale-solar-competes-large-scale-pv/ and http://www.ilsr.org/solar-economies-scale-update/ ... Mass-produced, plug and play small systems have their own economy of scale which may eventually overcome that of large custom systems as fixed interconnection, financing, and permitting costs come down. Very large systems have certain diseconomies of scale http://www.ilsr.org/solar-diseconomies-scale/ - most particularly the cost of transmission to bring the power to market, which is externalized by solar developers to utilities and ultimately all power customers. Negative media coverage has a lot of people thinking solar and other renewable energy sources are not yet ready for prime time. But nothing could be farther from the truth. In fact, we have the technology to get 100% of our energy from renewable sources. So what’s stopping us, and how do we get to 100% renewables? That question is being answered everywhere I look these days. A recent study claims that by 2030, we could power a large electrical grid with renewable energy 99% of the time -- without spending more than we do on electricity today. The key, given the intermittency of wind and solar, is to generate power in a distributed manner. But why stop at 99%? We have many tools at our disposal, including demand response programs, to get to 100%. On April 16 in San Francisco, we’ll have an exciting opportunity to learn more at the Pathways to 100% Renewable Energy Conference, organized by Renewables 100 Policy Institute and its Partners. This will be the first time that international experts meet in the US to discuss a complete switch to renewables. People from finance, academia, government, policy, labor, and technology will join in an intensive discussion about what’s working and the best ways to overcome the challenges to achieving 100% renewable energy targets in all sectors and regions. Last year, California's community shared solar bill SB843 came very close to passing. The Solar Gardens Institute supported the bill with some reservations. This year, the bill has been reintroduced as SB43 in the Senate and AB1014 in the Assembly with changes that merit enthusiastic support from anyone who supports equable offsite solar. It is probably the most thoroughly thought through legislative treatment of the subject to date. SB43 would create a 500 Megawatt pilot program, while AB1014 would authorize 1000 Megawatts. Projects can be up to 20 Megawatts in size. 20% of the capacity is reserved for residential participants, and 20% for projects less than 1 Megawatt in areas affected by pollution or with socioeconomic vulnerability. It also prevents solar gardens from displacing prime farmland, and allows for many other types of renewable energy besides solar. The bill also addresses securities regulation, a factor that has been a significant barrier to implementation of community solar programs. Renewable energy subscriptions are exempted from the definition of a security. To my knowledge, if this language becomes law it will be the first time this essential step has been taken in the United States. (See below). The full text of SB43 is available at the Solar Gardens Institute website. SGI is sending a letter of support to the bill's sponsors. You may sign on to the letter by emailing sb43@solargardens.org with your name, city+state, and organizational affiliation. 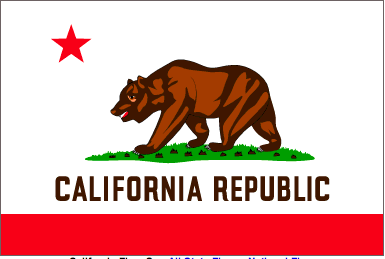 If you live in California, let us know the name of your state senator and assemblymember. Now, more than ever, we need your support for our legislative campaigns for community solar. Please donate $25, $50, $100 or more by clicking the button below. Note that since we are advocating for a particular legislative outcome, the donation is NOT tax-deductible. (ii) Areas with socioeconomic vulnerability.